The original idea was to use Grainline Studio’s cascade duffle coat pattern, but after much debate I decided that using a TNT pattern is the safer route to go – I dont have much time to play with the fitting of a new pattern these days and Cascade looks like it would need some adjustment for a person with curve. So I merged the front and front side pattern of Talea, and another rendition of Talea coat is born! Oversized hoodie, as usual. I love the little button poking out. Those oversized toggle & rope is one of my favorite buttons on coats so far. It makes me happy every time I need to button up. I was debating on using an actual shell from a bullet, but decided that I dont want to play with gun powder/lead too much. Real leather for pocket and toggle button patch. They are a pain to sew on. I lined the toggle patches against the dart on the bust – worked out very well. My awesome logo on the hoodie. A friend visited wearing a lulumelon jacket – with a logo on top. I decided to copy it and i love how it turned out! 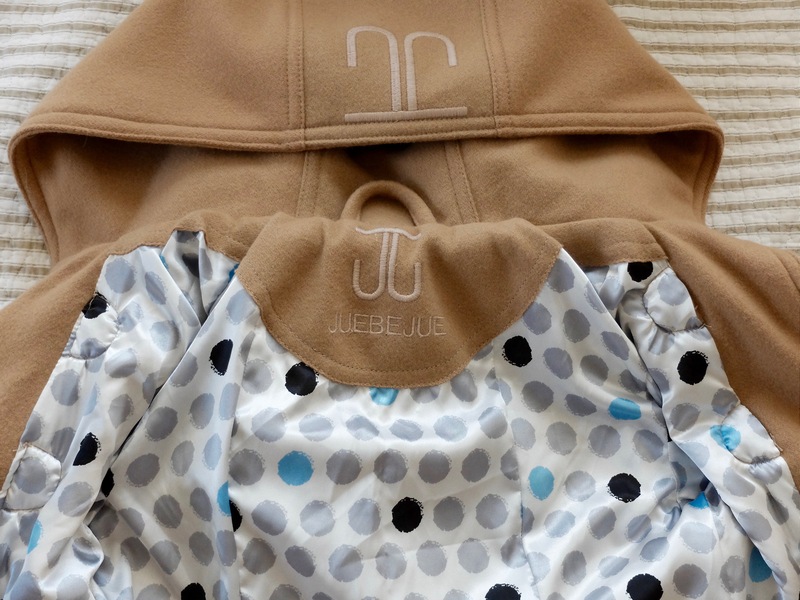 The inside is lined with a playful poka dot polyester slippery material, and more logo-ing as well. I wanted to put a tab on the back – but now I am digging this clean vertical lines on the back and also sick of working with this fabric. I think I will keep this as is. While I love how the coat turned out, I didnt enjoy sewing this coat as much I did with my previous coat. I think its because the material is a little funny. It is a wool with a rubbery, water-proof backing. But the wool feels very thin and the rubber feels thick. So the material is actually a little stretch-prone. The top stitches also sinks in quite a bit since its squishy. It feels like this coat will not last as long as my other makes – at which point I would have to remake one because I love it too much! This entry was posted on Thursday, February 11th, 2016 at 8:05 pm	and posted in finished pieces. You can follow any responses to this entry through the RSS 2.0 feed. That’s a gorgeous coat! I love that you put your logo on it. Looks really nice, and it’s great on you. Impressive and stunning ! You did a great job, I love your coat ! wow I love this, what a fantastic coat and all the great details. I hope it lasts a good while. Perfect for our climate. that pocket is so nice and the toggles are cool. it is perfect for bay area indeed! 🙂 love the weather that allows all range of style without worrying about REALLY having to bundle up! You’re amazing, well done! Love the details, the logo and the fact that you omitted the tab in the back, it would have broken those lovely streamlined seams. This coat is amazing! I had to do a double take while scrolling through my reader, and didn’t realize at first that you made it. I wanted to ask where I could buy it, lol. Beautiful coat! Love the buttons and all the other details.